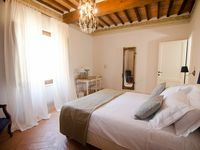 Property 3: Bed and breakfast camera "Olivo"
Podere Salicotto: Rosa - Double room "Comfort"
Property 36: Podere Salicotto: Rosa - Double room "Comfort"
Absolutely beautiful place to stay in Montepulciano. This place is beautiful,comfortable and convenient. Francy responded quickly to any question. We felt very pampered and spoiled staying there while we got to explore this ancient village. We enjoyed the local shops and restaurants, spectacular views and our only regret is not being able to stay longer. Very nice room, great location! Check is was very easy, room was spacious and clean. Parking lot P6 was relatively close and only cost 10 Euro/day. Air conditioner stopped working on the last day but that is no fault of the owners. I am sure it is fixed. I would stay here again if my wife and I return to Montepulciano.